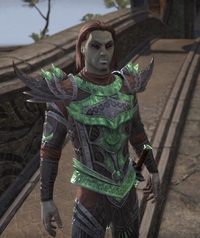 Armiger Gethan is a Dunmer soldier who can be found in the Temple Canton of Vivec City. "Another fine day in the service of Lord Vivec! I think I might even compose a song today!" "Only the most faithful can join the personal guard of Lord Vivec. I'm honored to serve among their number as a Buoyant Armiger." "Now that the city is safe, I feel like singing the praises of Lord Vivec from the tallest canton! Actually, I really do feel like that. If you'll excuse me, I have to go and figure out which canton is the highest."